At the Geneva Salon International Haute Horlogerie SIHH 2013 Cartier presented a collection of Les Heures Fabuleuses, presented three models – Panthere Divine, Tortue Secret and Peacock Motif. The new line symbolizes the commitment houses crafts. Jewelers, engravers, master carvers and mosaic breathed life into the magic kingdom of animals adorning the new hour collection. Cartier Panthere Divine – watch with loose diamonds. 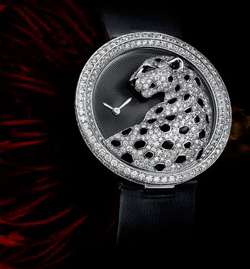 On the black dial is located favorite house Cartier – graceful panther, decorated with precious stones and black enamel inlays. Cartier Tortue Secret – watch a transformer is easily converted into a bracelet. Closed-dial, they look exactly like the precious bracelet decorated with a figure of a turtle of diamonds and semi-precious stones. Sliding shell opens eyes silvered dial flinque. Body – made of white gold with rhodium plating, strap – calfskin. The top three exquisite accessories close the clock Peacock Motif. Housing New made of 18-karat white gold and encrusted with diamonds. Exquisite carvings adorn the silver dial enamelled flowers and peacock figurine, decorated with diamonds and sapphires. The watch comes on a white calf leather strap with double folding clasp in 18-carat white gold. All three models of the new collection is based on quartz movement.